“Abraham Lincoln: Vampire Hunter”, based on the very entertaining novel by “Pride and Prejudice and Zombies” author Seth Grahame-Smith, shares the same goal as its source material: to entertain its audience with historical fiction that’s simultaneously well grounded with care for historical fact and wildly absurd in its premise. It’s interesting that the filmmakers behind Abraham Lincoln: Vampire Hunter actually held a press event and a Q&A session for the public back in February of this year at the Abraham Lincoln Presidential Library and Museum in Springfield, Illinois, because it’s a good bet that this film will never, ever be shown there, except perhaps as a prank. If it somehow is added to the library’s collection, it will no doubt languish in a basement floor far away from the eyes of patrons and scholars who would most likely avoid it, anyway. Here’s the story, and see if you can get through this without giggling a little. While still a young boy, Abraham Lincoln learns that his mother’s death was not, in fact, due to “milk sickness” as the doctors believe, but was in fact the work of a vampire. From that moment forward, the boy makes it his mission to “kill every vampire in America”, and that quest for vengeance in part informs and fuels almost every important decision he makes throughout his life, up to and including those dark and difficult years when, as president, he led our nation in a war to preserve its very existence. 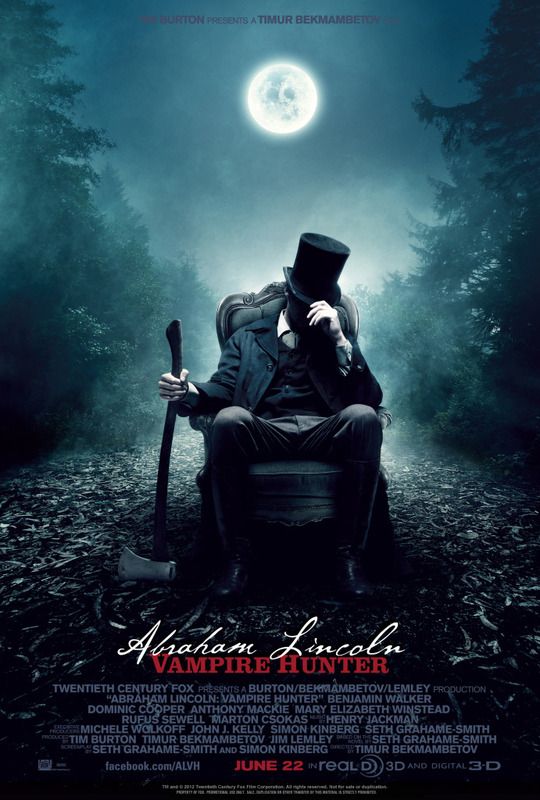 With the aid of his mentor in the art of vampire slaying, Henry Sturges (Dominic Cooper) and in the company of his childhood friend Willie Johnson (Anthony Mackie), Lincoln wages war against the undead using every tool at his disposal, and in the process, along with becoming the “Great Emancipator”, also becomes the greatest vampire hunter in history. See? I told you that you would giggle. The movie, which is based on the very entertaining novel by Pride and Prejudice and Zombies author Seth Grahame-Smith, shares the same goal as its source material: to entertain its audience with historical fiction that’s simultaneously well grounded with care for historical fact and wildly absurd in its premise. The best-selling novel more or less accomplished this feat by never once deviating from its structure as a biography being written using a “secret diary” as its source. Its tone is somber and authoritative, and Grahame-Smith holds your attention with his own attention to detail and his crafting of Lincoln’s “voice” through excerpts from the diary. It’s not a script for an action movie or a vampire horror flick at all; rather, it’s something more humble: an account of a great man’s life and struggle with the evils in the world around him, being relayed to us by a biographer who himself finds the story almost impossible to believe. The fact that the biographer (a fictionalized version of Grahame-Smith himself) has to suspend his own disbelief as he tells the story helps the reader to do the same thing, and to be taken in by the storytelling. The film is far less successful in trying to achieve that same level of suspension of disbelief in part because it abandons, or rather never even attempts, presenting itself as a biopic. Instead, director Timur Bekmambetov (Wanted), working from a script written by Grahame-Smith adapting his own novel, treats it all like a non-Marvel superhero movie, filling the spaces between well-rendered recreations of actual historical events with his signature brand of slow-motion, special-effects laden, latter-day “Matrix”-style action. Those embellishments just serve to make the whole thing all the more ludicrous. Watch for one particular set piece in which Lincoln battles a vampire in the midst of a horse stampede, and be prepared to hear people in the audience around you laughing when they really shouldn’t be. It’s a shame, because what almost gets lost in the midst of the over-the-top set pieces and copious amounts of blood and gore is a committed, powerhouse performance by actor Benjamin Walker, who plays Lincoln both as the young man at the start of his quest for vengeance and as the 50-year-old president leading the Union in the Civil War. It’s an uneven performance; as the young Lincoln, Walker doesn’t completely disappear into the role, and instead looks like an actor struggling to find the man’s real persona. When he introduces himself to people and says the name “Abraham Lincoln”, you don’t believe that HE believes it – it sounds like he’s pretending. The supporting cast for the most part does him no favors either: Dominic Cooper (Captain America: The First Avenger) sounds throughout like he’s struggling to maintain both his accent and a straight face through all the leaden dialogue he’s asked to deliver as Henry Sturges, while veteran character actor Rufus Sewell’s considerable talents are utterly wasted in the role of Adam, a lead villain so bland and derivative that he could stand to learn a thing or two about menace from the vampires in the Twilight films – yes, the ones that glimmer. Only Mary Elizabeth Winstead (Scott Pilgrim vs. The World), in the role of Lincoln’s beloved wife Mary Todd, seems at ease with her role and what it asks of her, and even she has trouble saying the name “Abraham Lincoln” without sounding more like someone who studied Lincoln in school, rather than someone who is addressing the man directly. It’s only in the last third of the film, when make-up has transformed Walker into the Lincoln we recognize from the statue in the Memorial in Washington and the $5-dollar bill, that the actor fully and compellingly realizes the character, and you buy what he’s selling. In the end, Walker’s work here may be considered similar to what Josh Brolin did in the lead role of box-office bomb Jonah Hex a number of years ago: a memorable performance trapped in a mess of a film. As flawed as Abraham Lincoln: Vampire Hunter is — and, boy oh boy, is it flawed — it’s very difficult to just dismiss it as summer popcorn movie rubbish. 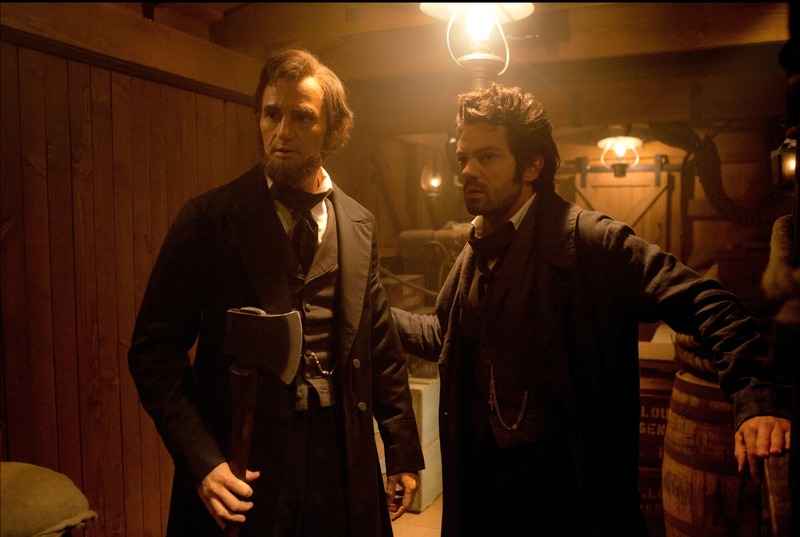 The meticulous effort to make as many of the real-life historical people and places that appear on screen as authentic as possible, and to still somehow be reverent toward the personage of our 16th President while at the same time turning him into a badass superhero wielding an axe, is evident in every frame of the film. But that’s what’s so frustrating about the movie, too, because why would you work so hard to craft a drama that takes its setting and circumstances so seriously and then mar it with stylized action sequences so bombastic that they leave the audience laughing out loud? It doesn’t make any sense. Starring Benjamin Walker, Dominic Cooper, Anthony Mackie, Mary Elizabeth Winstead, Rufus Sewell, and directed by Timur Bekmambetov. Rated R for violence throughout and brief sexuality.